The sun is the dominant force on our planet. People from the earliest time knew it powered the abundance of nature, and set the pace for the seasons and governed the rhythms under which they operated. It stands then for warmth, clarity, reason and fulfilment. 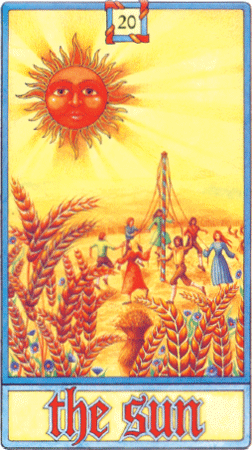 The Sun Card tells us to make hay while the sun shines, that there are psychological times that are opportune for us and that we should enjoy happiness. In the past we have sown well; now we can reap the fruits.